An often exhilarating, kaleidoscopic manhua combining the traditions of overblown martial arts and the simple, fantastic stories of folklore, Kung Fu Panda 3 pushes the series forward towards its potential as a centerpiece of biculturalism. A co-production between DreamWorks and Oriental DreamWorks, Kung Fu Panda 3 is the first major American animated film to be co-produced with a Chinese company. Despite its goofy veneer, the Kung Fu Panda series has long incorporated Chinese mythology into its narratives — it’s no coincidence the main characters anthropomorphize a variety of Chinese martial art disciplines (mantis, tiger, monkey, crane, snake, and — in lieu of panda — dragon). Directors Jennifer Yuh Nelson and Alessandro Carloni, along with executive producer Guillermo del Toro, understand the rich (ha) potential of China, delivering the third chapter as an extraordinarily accessible fable drenched in the life-encompassing chi that inspired George Lucas’s Force. 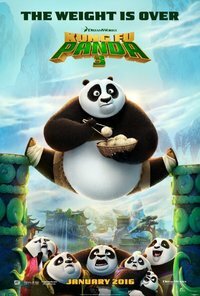 Po (Jack Black) the panda, protects his valley home as the legendary and prophesied Dragon Warrior until supernatural trouble catalyzes another quest for personal growth. Two new figures enter his life — his biological father, Li Shan (Bryan Cranston) and the power-hungry spirit Kai (J.K. Simmons) — that thrust him out of comfort once again on a journey to stop an unstoppable force by better understanding himself. A simple enough plot underestimates its audience through repetitive explanation while our brains progress through its Campbellian story components like assessing the trajectory of a baseball: an unconscious appraisal that allows us to focus on other things, like running in the outfield or cackling to one-liners with our kids. The jokes, often quite good, come from a variety of talented actors: Seth Rogen and David Cross slay as the snide Mantis and Crane, but the deadpan delivery from venerable talents like Dustin Hoffman and James Hong embrace the versatility of their talents. The entrance of Po’s panda father means that the noodle shop owning goose, Mr. Ping (Hong), who raised him faces genuinely touching problems of jealousy and fear. While his alloparenting introduces the loving theme that parents can be defined many different ways, with Po eventually referring to his “dads”, the lessons are not exclusively father-based. Deeper themes of personal acceptance and cultural heritage mesh with the modernity of multiculturalism. The dichotomy of intentions vs. results when raising a child, as well as the fathers’ eventual embrace of each other’s importance in Po’s life, provide the most moving moments of the film. However, some of the production seems leftover from different cuts of the production. The hidden panda village to which Po returns features a slew of names but few memories, like the first day on the job. Kate Hudson’s Mei Mei, an aggressively flirtatious ribbon dancer, feels like an ineffectual toy whittled from the branch of a cut sub-plot. If the filmmakers reigned Black’s sometimes grating riffing (he’s played the same character since…his cameo in X-Files? High Fidelity? ), they’d have time for the endless characters they’d like to merchandize. This feeling of competing priorities floods over to the specifics of the plot, as well. Despite deigning to the mystical, the climatic embrace of chi becomes a mistuned magical panda ex machina. The real draw here, though, is the animation. Visual spectacle enthusiastically speeds along, driven by excellent 3-D effects (including some unique paneling shots done as well as the unique Scott Pilgrim vs. the World) and rapid editing diverse enough to intone the film’s various montages and battles with a joyful beauty and softer brushstrokes than the sharp, bombastic cartoonishness found in Japanese-inspired anime. Fights, often stakeless and narratively flat, demand attention with perspective depth and gorgeous art style. A variety of moves and the imaginative environments in which these battles occur provide a clumsy captivation in the vein of Jackie Chan’s Drunken Master series. The divine spirit of fools run deep within a film too relatively light and inconsequential to have too much staying power, but as an artistically rich Saturday morning puff piece, you could do far worse.